It’s been a terribly unhappy 2014 Everest season for many reasons, so here’s something to cheer us all up. We all thought the season on the south side of the mountain finished two weeks ago after officials from the Ministry of Tourism flew into Base Camp by helicopter to eat omelette and pancakes before flying out again (I’m not kidding, I watched this happen). But various reports in the Himalayan Times over the last few days have fuelled speculation that the Southeast Ridge may yet be climbed this year. 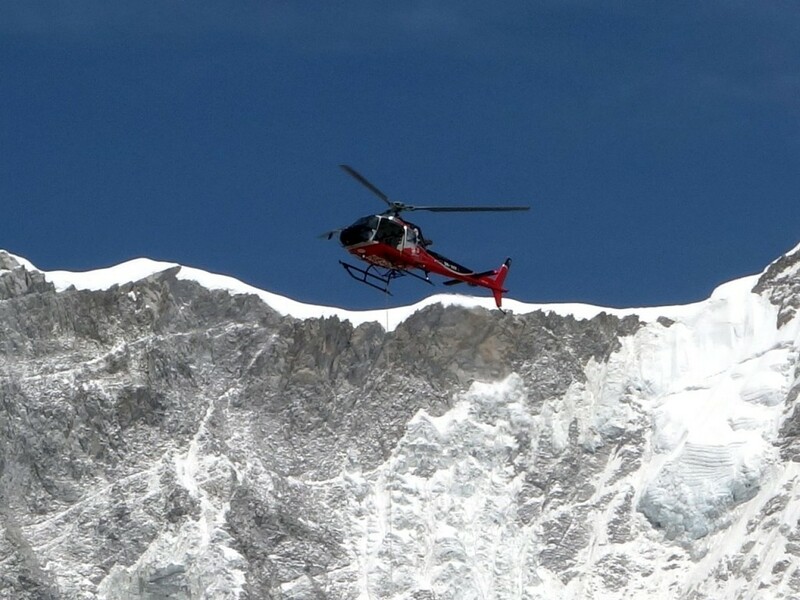 A helicopter flies over Everest Base Camp, but have climbers been chartering them to fly into the Western Cwm? On Friday they reported that two legendary female mountaineers Cleo Weidlich and Jing Wang still intended to climb the mountain by chartering a helicopter to fly them up to Camp 2 in the Western Cwm (“legendary” isn’t the adjective most people would use to describe these women). Neither climber was being supported by their original teams: Weidlich was planning to climb the mountain solo, while Jing had hired 7 new Sherpas to help her. 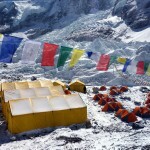 The report contained a number of inaccuracies, not least by stating Weidlich had already flown to Camp 2 when in reality she was still at Base Camp, and that various expedition operators had hired helicopters to transport her equipment up there for her (these operators had indeed hired helicopters, but only to cache the equipment their Sherpas had originally carried up there in preparation for next year). Then on Sunday they stated Jing had also flown up to Camp 2, and this report was given more credence when Russell Brice, owner of her original outfitter Himex confirmed it in a newsletter, stating that he did not support her attempt. Both women are relatively inexperienced climbers with no real idea of what they are facing. Without the help of their teams the chances of success are virtually nil. 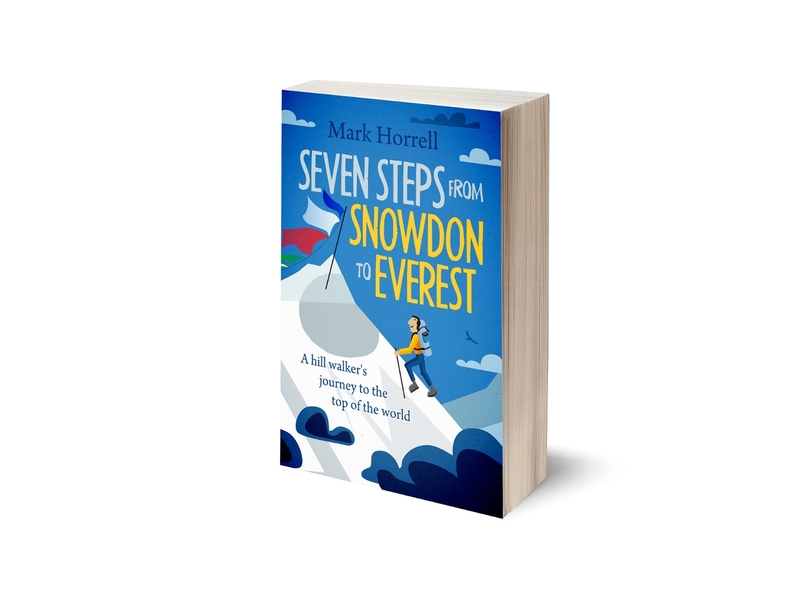 But what if a fully supported team were to return to Everest and try again by flying into the Western Cwm by helicopter, where they would find tents, stoves, food and ropes which had been cached there from earlier in the season? Would such a team have any chance of success? 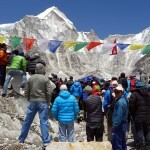 The Everest season was shut down for a number of reasons, chief among them because the Khumbu Icefall was considered too dangerous this year, Sherpas who did climb faced physical threats and intimidation from other Sherpas who did not want them to, and the Icefall Doctors who maintain the route through the Khumbu Icefall were no longer working. By flying into the Western Cwm, the Khumbu Icefall would be bypassed and some of these reasons would no longer be applicable. As I sat in New Orleans bar in Kathmandu drinking Belgian beer with my two remaining team mates from the Altitude Junkies team, Margaret and Edita, we read about the madcap scheme of these two “legendary female mountaineers” and hatched one of our own. Most of our Sherpa team were still in Lukla awaiting a flight back to Kathmandu. Did any of them fancy another tilt at the mountain? Supposing we could persuade our expedition leader Phil Crampton to charter a helicopter for us and mobilise the Junkies into action again, perhaps we could still climb? The three of us were on Lhotse permits rather than Everest, so not as much rope would be required to fix the route. Margaret pulled out her phone and we began texting him. You will see from the last message in the sequence that we decided to leave New Orleans, buy some beers in a supermarket and take them round to Phil’s office. But when we arrived we found it locked up; the place was deserted and Phil had made his escape. With him went any last remaining chance of a commando raid on Lhotse’s summit by the Junkies. We can assume from this that, chopper or no chopper, according to Phil Crampton there will be no summits from Everest’s south side this year. That’s as maybe. On the positive side, rarely have I had so much fun sitting in a bar waiting for someone’s phone to go beep. Don’t forget the Minister also enjoyed some garlic soup so the trip was more productive than you give him credit for! Hi Mark,drink more beers with Phil, if you decide to resume the climbing, let me know, I will fly to Kathmandu from Shanghai tomorrow. Maurizio Folini says, “Weidlich flew on May 8 from Gorak Shep(5,164 meters)”, which is in agreement with HT report (on May 9th). Thanks for sending the link. Very interesting, though not 100% convincing. It contradicts the statements we were receiving from Sherpas in base camp, who said Cleo was still there, so somebody’s wrong. The report is in Italian, so some of the facts might be getting lost in translation, but here’s a summary of what I think’s being said here. The Italian helicopter pilot Maurizio Folini, who works for Fishtail Air, says he transported Cleo Weidlich from Gorak Shep to Camp 2 in the Western Cwm on May 8, and Jing Wang a couple of days later. Folini also says he transported all of their equipment, including 2 miles of rope, and that it took 12 flights to accomplish this. I wonder how many of these flights involved carrying just the rope? This was one of the issues that was highlighted by Phil when we were grilling him about the practicalities of another attempt: there’s simply not enough rope in the Cwm to fix the route to both summits (Everest and Lhotse). Two miles of rope (3200m) is barely enough to fix the route up Lhotse (whose summit is 2100 vertical metres about Camp 2), and is nowhere near enough to go all the way up the Southeast Ridge to the summit of Everest. What Folini hasn’t said is how much he charged for the flights. Earlier reports suggest $2,000 USD per flight, which means a grand total of $24,000, small change for Ms Jing, who owns a clothing company and wealth numbered in millions, but an astronomical sum for most of us (and probably Cleo Weidlich). The plot thickens. The only thing I know for sure is the chances of a south side summit this year haven’t improved much! Indeed, the chances of success on Lhotse and Everest this season are still minimum (or almost non-existent if we consider acclimatization of two climbers and weather forecast). Even North side teams aren’t expecting summit attempts before May 27th. However, Ms Jing’s situation reminds me of a 2013 news story (probably incorrect), that a Chinese millionaire hired a full team to fix separate ropes for him on Everest North side. 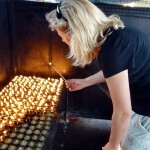 Previously, she had summited Everest twice, Lhotse, Nuptse, Manaslu, Broad Peak and Lobuche Peak. On the Himex website, it states “…she climbed the steep technical slopes of Nuptse and then 4 days later climbed Everest a feat that few can do. I am also quite amazed at how this lady can achieve so many mountaineering feats…” (on the Himex website). In 2014 alone before her Everest climb, she reached the South Pole (Jan 15), Mt Vinson (Jan 22), Aconcagua (Jan 31), Elbrus (March 14), and North Pole (sometime in April), and some other peaks. My point is that your article gives the impression that she’s inexperienced and reckless (though not many words were said), which I think was a quick and unjust judgement on your part. My issue with Ms Jing as not so much her climbing CV as the manner she uses her wealth to pursue her agenda with little consideration for the consequences it has for other people. Can you tell me how much she paid her 5 Sherpas to take her up Everest when others were on strike or fearing repercussions if they worked? Can you tell me how her wages compared with those of other Sherpas, or how her own Sherpas’ community reacted when they returned home with unspeakable wealth? Can you tell me how much she paid to government officials to present her with an engraved plaque in an elaborate ceremony to mark her achievement (http://www.thehimalayantimes.com/fullNews.php?headline=Wang+to+receive+mountaineering+award+today&NewsID=419764) while they were banning the pilot who flew her up Everest from operating (http://thehimalayantimes.com/rssReference.php?headline=Italian+pilot+pays+price+for+airlifting+Wang&NewsID=420042). It’s likely her actions will have other consequences. While she was busy flying up Everest in pursuit of her Seven Summits record her expedition leader Russell Brice of Himex was making representations to the Nepal Ministry of Tourism on behalf of Sherpas and clients. These included better working conditions for Sherpas and an extension of the permit fee for clients who had been unable to climb because of the strike. Instead of listening to his pleas, which would have benefited all parties in the future, the Ministry turned a blind eye and threatened him with a ban from operating because of the actions of his rogue client Ms Jing. It is possible they may use her ascent as a reason for not extending the permit fee, by claiming it proves people could climb Everest despite the strike. I don’t know whose respect she is trying to earn by pursuing her Seven Summits record so ruthlessly. Perhaps it is businesses in China who she hopes will provide her with sponsorship if she succeeds. Perhaps it is consumers in China who she hopes will buy more products from her outdoor equipment company. When she has finished bagging her Seven Summits record with whatever means she has at her disposal (for what that’s worth) I hope she will think about the consequences of her actions and use her wealth more positively and considerately in future.